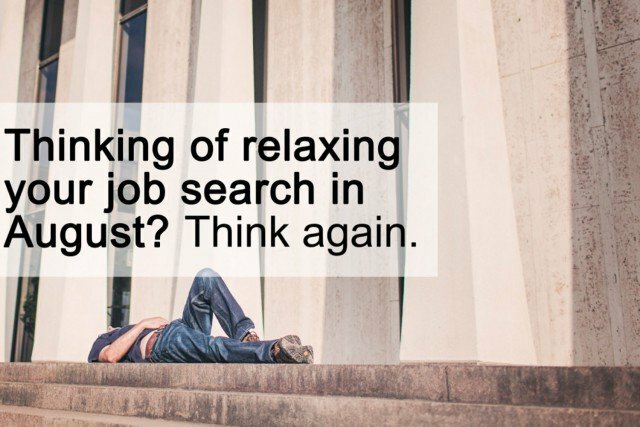 Thinking of relaxing your job search in August? Think again. It’s been one of those historic ‘true-isms’ that things quieten down a bit in August in the recruitment market. Quite a few people take what seems to be the entire month off for one reason or another, and it’s their business whether they go on an extended holiday or other break of course. However, if last August is anything to go by then ‘taking your foot off the gas’ in August could be a mistake, especially if you’re going to be around anyway. For me, as an executive career coach, last August was my busiest ever. Many clients found successful roles during August last year, so if you’re a senior level executive currently engaged in a job search (& you’re not going away for August!) I urge you to maintain the activity, keep networking, keep connecting. Identify 20 companies you’d like to work for in your sector: then decide whether to approach direct or to engage a recruiter in the search. Set yourself a weekly connections target on LinkedIn, and have a follow up strategy based on whether the contacts are senior peers or head hunters. Create time to unwind and relax. You’ve heard the phrase ‘job hunting is a full time job’? My take on this is that you need time out also, to maintain and rebuild confidence, resilience, and simply to maintain a level head. Write a sheet outlining three value- adds that you bring to the table for your targeted role, and keep it posted where you will see it, just in case a recruiter calls and fires this kind of question at you. Let me know if you’d like any further tips re maintaining focus during your job search. If you found this article useful, please share it via the social sharing icons below. Thanks.